macOS Sierra has all sorts of features to make your Mac more powerful and more efficient, and to help you increase your productivity. It also contains a great feature that you might not know about, called Optimized Storage, which can help you increase disk space. This new Optimized Storage feature in macOS Sierra helps you find and remove unneeded files that are clogging your drive. Optimized Storage is particularly useful if you have a Mac with an SSD; these solid-state drives have much less capacity than hard drives, so you need to be parsimonious in what you store on them. 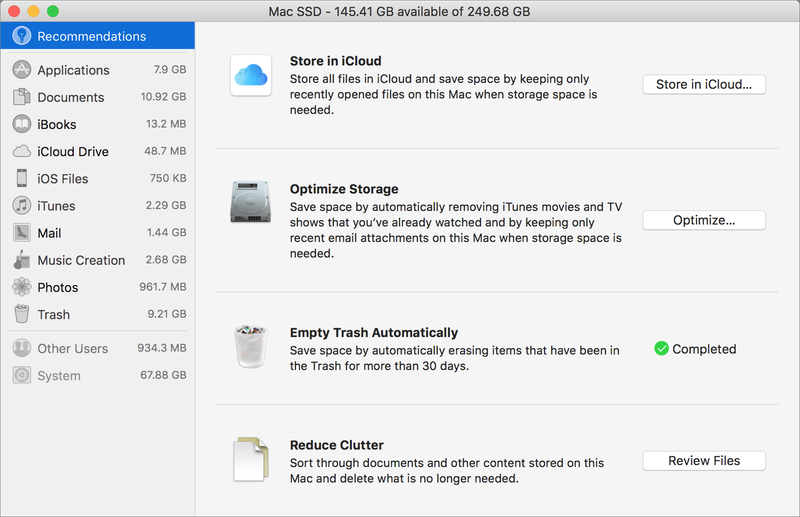 While there are several ways to increase available disk space, this article covers how you can use Optimized Storage to free up space on your Mac. Go to Apple menu > About This Mac. In the window that pops up, click on the Storage tab. Below is a screenshot from my MacBook; it has a 256 GB SSD, and I keep it fairly empty. (It’s not my main Mac, so I don’t store lots of files on it.) I’ve hovered my cursor over the Purgeable section of the storage bar; it shows that about 6 GB can be safely removed from my Mac. You may find much larger numbers, depending on what type of files your Mac contains. These purgeable files are ones that macOS can remove for you, sometimes even automatically, to ensure that you have enough space on your drive. You’ll see below how to tell your Mac to do this. In the window that pops up, click on the Storage tab, and then click the "Manage..." button. When you click Manage, you'll see the recommendations for how to cull unneeded files. Many of these are the purgeable files that macOS Sierra assumes you can safely delete, since you can easily re-download them. There are four main recommendations, plus a number of entries in the sidebar that you can consult. Store in iCloud lets you save space by offloading some of your files to iCloud Drive. Optimize Storage lets you choose to have your Mac automatically delete movies and TV shows in iTunes when you’ve watched them, and only download recent mail attachments. 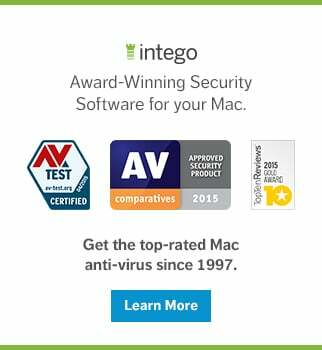 This saves a lot of space if you buy or rent iTunes videos, or receive many files via email. Note that you can revert these settings in the preferences for iTunes and Mail. Empty Trash automatically tells your Mac to delete files that have been in the Trash for more than 30 days. You can, of course, manually delete the Trash, but if you don’t often do so, this is a good setting to turn on. Reduce Clutter lets you find files you don’t need to keep. 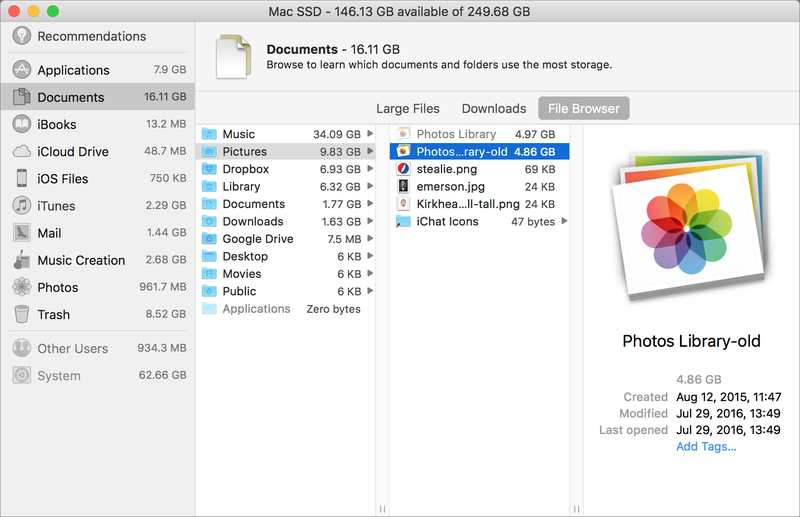 Want to locate large files on your Mac? If you click Review Files in the Reduce Clutter section, you will see a list of the largest files on your Mac. You can go through this list and delete any you don’t need. These may be videos, software installers, or other files. A Downloads tab lets you scan your Downloads folder in list view, showing the size of files. Furthermore, you can use the File Browser to view the contents of your Mac sorted by size. For example, in the image below you can see that I have an old copy of my Photos library, perhaps created when I updated to macOS Sierra. I can delete that and save nearly 5 GB. Applications shows the applications you’ve installed on your Mac. You can sort them by Size, or by Last Accessed. You might want to find the applications you haven’t used in a long time; do you really need them? If not, delete them to free up space, especially if they’re large and are easy to re-download. Be careful, though; the Last Accessed date, on my MacBook, is wrong. An app I launched just yesterday shows as Last Accessed in 2012. Not everyone has this problem, but I’ve heard from others who see the same thing. Documents shows the same column browser you saw above from the Reduce Clutter option. iOS Files are old updaters for iPods, iPhones, and iPads. These can take up a lot of space. You don’t need to save anything other than the latest updater for each device; and if you have good internet bandwidth, you probably don’t even need these, since they’re easy to download through iTunes. Music Creation shows files that are installed for Garage Band. If you don’t use that app, click Remove Garage Band Sound Library to save several gigabytes of space. 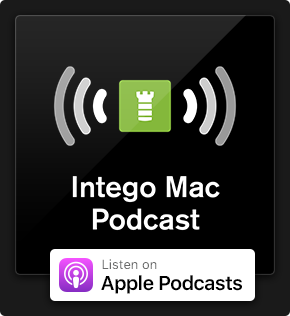 While macOS Sierra shows you some of the files you can delete to save space, you can go even further with Intego's Mac Washing Machine. Mac Washing Machine cleans plenty of files that macOS Sierra doesn’t, such as caches, logs, extra language files, and more. It also searches for duplicates, and helps you organize files on your Desktop, on the Dock, and in smart folders. Take it for a spin and see how much extra space you can reclaim on your Mac! This entry was posted in How To and tagged macOS Sierra, Optimized Storage. Bookmark the permalink.